An obscure single ship action off the coast of South America, though inconclusive, was of enormous significance for future naval warfare. It involved a British cruiser, HMS Shah, and the Huascar a rebel Peruvian ironclad. Quite amazingly one of the ships involved can still be seen today. In early 1877 a failed revolution in Peru resulted in the leader of the defeated party, one Nicholas de Pierola, being lucky enough to suffer nothing more than being banished from the country. Though he lacked further support onshore in Peru he did have adherents in the Peruvian navy. 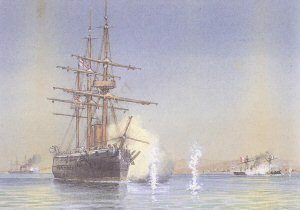 Two officers of the small iron-clad the ship Huascar – brothers named Carrasco – seized her as she lay in the port of Callao and secured the support of her crew. 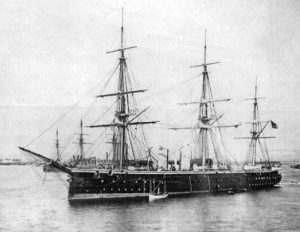 Though small, the Huascar was most formidable vessel in the Peruvian navy. Built at Birkenhead by Laird Brothers in 1865 on a displacement of 1130 tons, she could make at maximum some 10 knots, and she carried two 10-in. Armstrong rifled muzzle loading cannon (RMLs) in a closed turret amidships, these throwing a 300-lb. projectile. 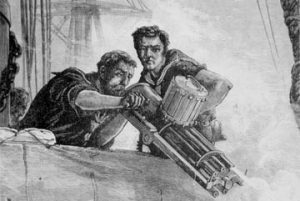 She also had two 40-pounderrifled pieces mounted one on each side of the quarter-deck, plus a 12-pounder under the poop. Huascar’s armouring was also impressive – her turret wall was 5.5-inch thick, with a 14 – in. teak backing. The maximum thickness of her side plating was 4.5-inch, tapering to 2.5-inch at the bow and stern, backed like the turret with teak. She was brig-rigged with a tripod foremast, and had a freeboard of 4.5 ft. Her bows were designed for ramming. 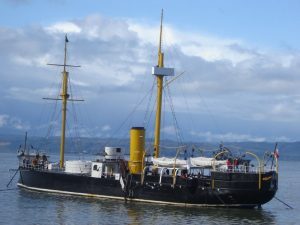 As such Huascar was represented an example of what was to be a very profitable export for British French and Italian shipyards in the coming decades – the sale of modern warships to South American countries that could not afford them and had little if any need for them. After seizing the Huascar the insurgents sailed to a Bolivian port (Bolivia still had a small coast at the time) where Pierola himself boarded. 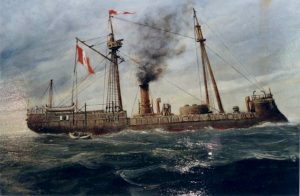 She then steamed up and down the Peruvian coast, bombarding such towns as refused to pay ransom, The rest of the Peruvian navy – another small iron-clad, a corvette, and a gunboat – put to sea and fought her for an hour and a half. The encounter resulted in no great harm being done on either side. 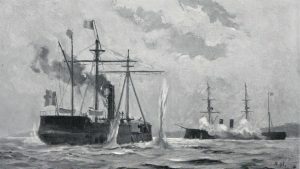 The British Commander-in-Chief on the Pacific Station, Rear Admiral Algernon de Horsey, received an urgent summons one day from Britain’s chargé d’affairs at Lima, who informed him that the Huascar had stopped two British mail-steamers and had forcibly taken coal and stores from them. The offence to the British flag and prestige was intolerable. A formal complaint was made to the Peruvian Government, but it disclaimed all responsibility. It did however identity the Huascar to be a pirate and offered a reward for her capture. de Horsey now put to sea in his flag-ship, the Shah, with the small wooden corvette Amethyst in company, and started the search for the Huascar. HMS Shah was an unarmoured ship of 6250 tons, with a speed of some 15 knots maximum. She was very unhandy, and had a huge turning circle. Her armament consisted of two 12-ton guns, throwing a 250-lb. projectile, with a nominal penetration of 8.4-in of wrought iron at 2000 yards; sixteen 6.5 ton guns, with eight on each broadside, throwing a 112-1b. shot, theoretically capable of penetrating 5.5- in. of iron at, 2000 yards; and eight 64-pounders. Her company numbered 602 officers and men, and she was ship-rigged with heavy masts and spars. The Amethyst carried nothing bigger than a 64-pounder, and had little or no fighting value. She was to play no significant part in what was to follow, which was essentially to be a duel between Shah and Huascar. The Huascar was discovered lying off the small town of Ylo, in the afternoon of the 29th May. The admiral immediately sent a boat with a message to Pierola that if his flag was not hauled down within the hour the Shah would open fire. The boat returned without an answer. The Shah then fired a blank charge and getting no response, followed with a shot across the Huascar‘s bows. The Huascar replied with a shell from her turret, and got under way, steaming slowly to and fro before the town, thus considerably baulking the Shah‘s gunners, who had repeatedly to cease firing to avoid the risk of hitting civilian buildings on shore. The Huascar drove on towards the Shah but at 400 yards separation her captain’s nerve failed and he turned tail. As she went about the Shah fired a Whitehead self-propelled torpedo at her from one of her deck-mounted tubes, but as the torpedo’s speed was only nine knots, and the Huascar was teaming at least ten in the same direction, no hit was scored. The event was however of great historic significance however, as it was the first time that that a self-propelled torpedo was fired in anger. The track of bubbles gave evidence that the shot was a straight one, and had the Huascar been stationary her fate should certainly have been sealed. The Huascar now had had enough of it, and steamed close in under the town as darkness fell. The Shah ceased fire and steamed out of range. She had one last card to play. Several hours later she sent in her steam pinnace, armed with a spar torpedo in her bows and towing a whaler which had a Whitehead torpedo alongside. This attack might well have proved successful but Pierola and the Huascar had slipped away into the darkness. Two days afterwards he surrendered the ship to the Peruvian Government at Iquique. The action was not particularly creditable to the Royal Navy’s gunnery. The Huascar had been struck by only one shell from the Shah‘s 12-ton guns. It had hit the ship’s armour plating on the starboard side about 50 feet from the stern, penetrating the iron and bursting in the backing, but damaging nothing material. Two 112-Ib. projectiles had dented the side armour but failed to penetrate, though theoretically they should have done so; and one had hit the turret a direct blow but remained sticking in the armour. These four hits were the only ones recognisable as having being made by the Shah‘s heavy guns. The Huascar‘s boats, funnel, bridge, and upper works had been hit by numerous projectiles from the 64-pounders of the Shah and Amethyst, but the little ship was in every degree as sea- and battle-worthy at the end of the fight, which lasted nearly three hours, as at the beginning. She one man killed and two or three wounded. The Shah would have been doomed if Huascar been able to hit back effectively with her big turret guns. In extenuation of the Shah‘s performance it may be said that the small Huascar was not an easy target. The dark background of the sloping shore behind her made it difficult to estimate the range correctly. Nevertheless, given her that she carried so much heavy metal, the Shah might have been expected to do better, especially since it was obvious after the first half hour of the engagement that there was nothing to fear from the competence of the enemy gunners. It does not appear, however, that any one was much struck with the poor results produced by the Shah‘s heavy guns or that any officer was censured. The Huascar’s career was far from over. She fought Chilean forces in the War of the Pacific (1879-84) and was captured by them. Se thereafter played a role in the 1891 Chilean Civil War and was later preserved as a national treasure. Today the Huascar is berthed at Talcahuano, Chile. Though the Naval Base and Shipyards there were damaged by the 2010 Chile earthquake and the resulting tsunami the Huascar survived unscathed. They certainly built them tough at Lairds in Birkenhead in the 1860s!